Okay, it’s not always the woman’s fault…. This modern Asian wedding is just an all-around bad idea. Every day on the way to White Beach back in 1999 I would pass what appeared to be ruins on a hilltop among the urban sprawl of Okinawa’s Katsuren peninsula. 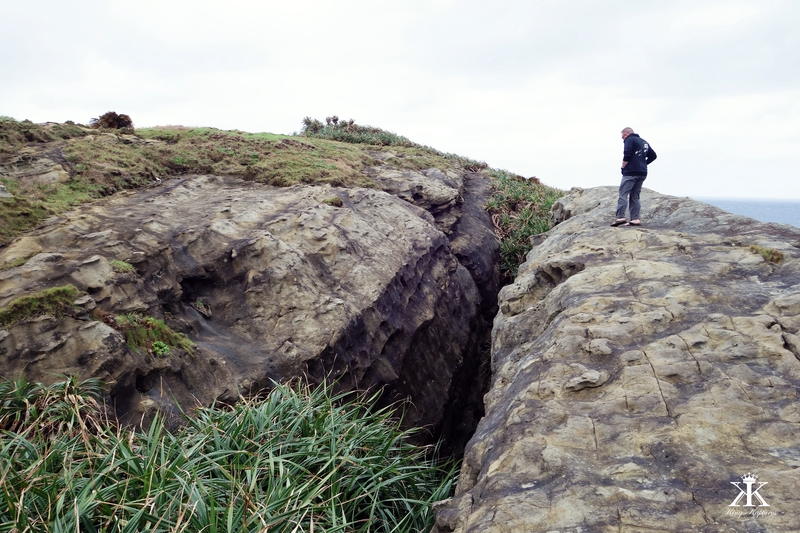 Then for a few weeks, there was intense activity at the site, something which of course peaked my interest. Finally deciding to play hooky from work one day, I turn my Honda Accord hatchback up the steep, crudely constructed concrete hillside road and barely made the climb to a grass and gravel parking lot. And then my adventure really began! 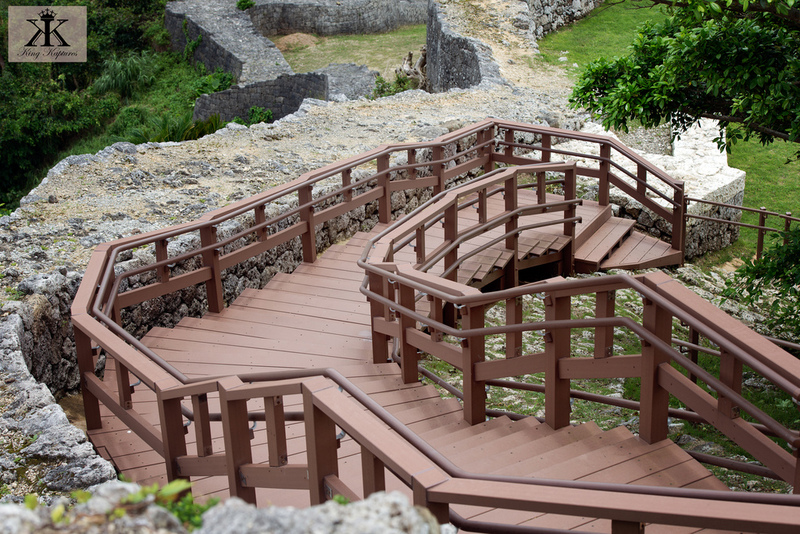 It turned out that these ruins, once the site of one of the most significant castles of Okinawa which played a key role in Ryukyu history, were being hastily (and only partially) rebuilt, repaired, restored and cleaned in anticipation of a millennial celebration in early 2000. And thus began my love affair with this castle that I admired during my daily commute to and from work, and to which I visited often with my family back in the early 2000’s when we lived on Okinawa for almost four years. 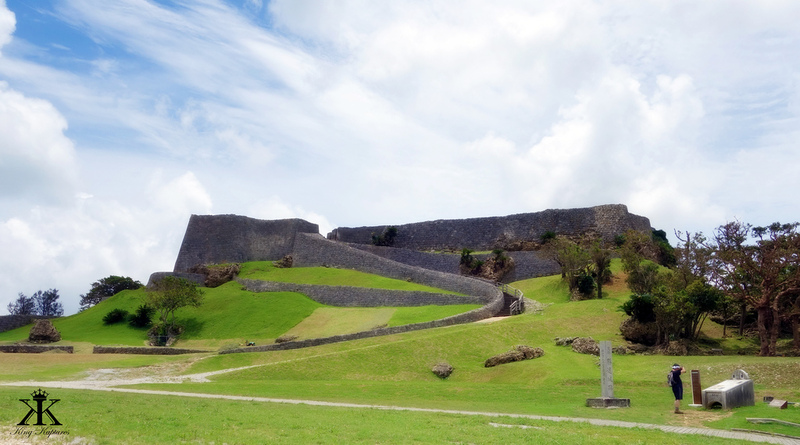 One inescapable aspect of living on Okinawa is that the very ground is dotted with a plethora of intriguing castle ruins, reflecting in the present the rich Ryukyu past when regional kings fought a series of wars over their fiefdoms, eventually leading to the unification of the Kingdom of the Ryukyus. 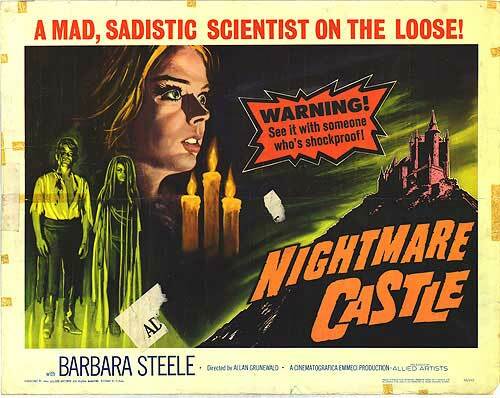 By some accounts, there are upwards of 500 documented sites that once held a castle, large or small. 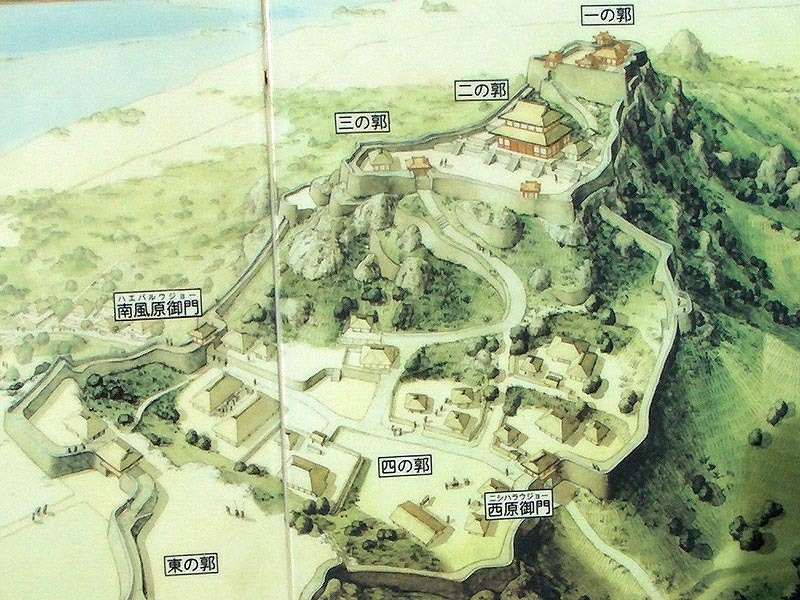 Artistic Impression of Katsuren in its Heyday. 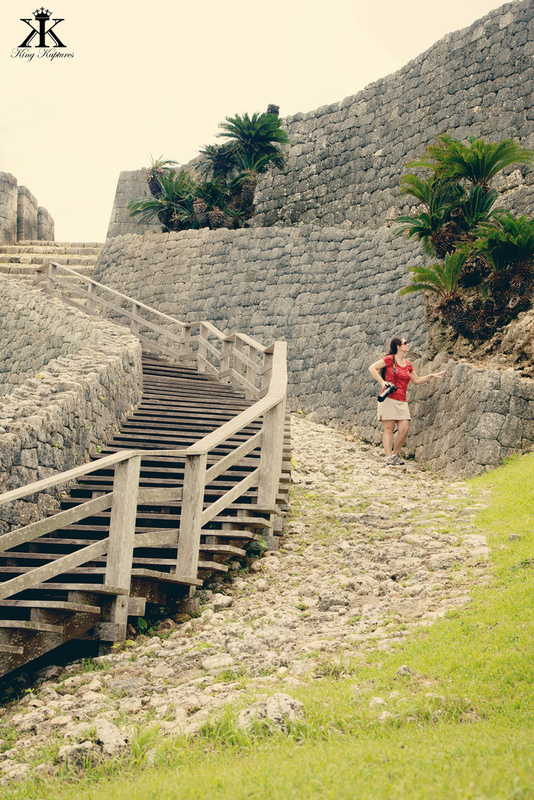 Okinawan castles are often called gusuku, and are indicated by a “- jō ” suffix in writing. 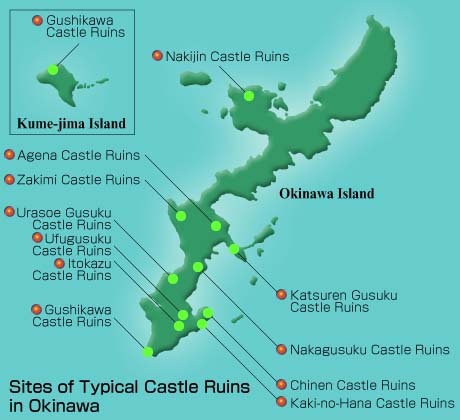 But “castle” is a bit of misnomer; a gusuku is more akin to fortresses of regional chieftains, dating to a time when Okinawa was independent from Japan, and more aligned with Korea and China. Except for Shuri Castle, completely destroyed in World War II but impeccably restored to its rightful grandeur, most castles exist as ruins, many just mere crumbling stone walls. Although little may be visible to the eye, the remains of the day reflect the strong history of Okinawa and remain culturally important. 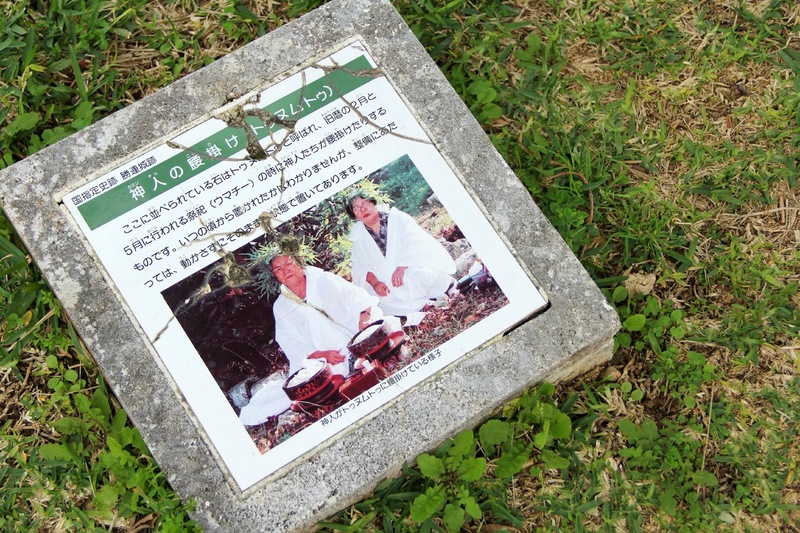 In fact, all the places where gusuku once stood are regarded as sacred sites, still used as active places of worship and for religious and cultural ceremonies by local residents. Lord Amawari portrayed in modern times. Unfortunately, much of the specific history of most of the sites remains unknown, with little specifics being well-recorded. Primarily, we know those that had developed into strong fortresses, having been led by powerful chieftains that grew in size and stature by subsuming lesser gusuku. 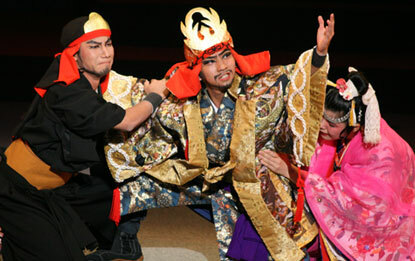 Three of the most famous chieftains in Okinawan history are Lord Amawari of Katsuren, Lord Gosamaru of Zakimi and Nakagusuku, and Lord Hananchi of Nakijin, all on the main island of Okinawa. 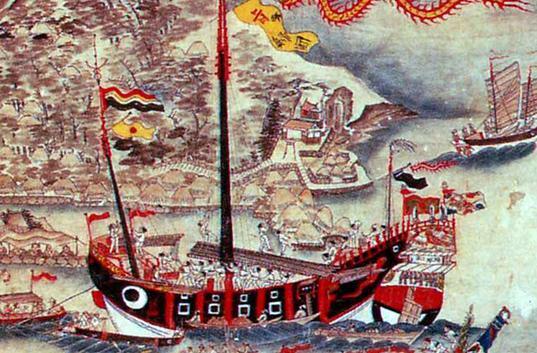 Archaeological excavations at their respective castle sites prove the power and wealth of these Sovereigns, and show their entrenched engagement with China and other Southeast Asian countries. 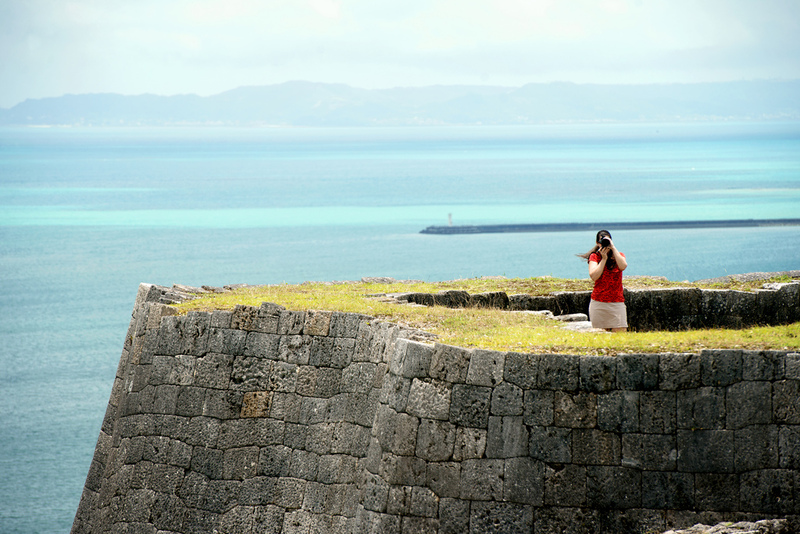 One of the most popular sites among visitors is Katsuren Castle on Okinawa’s central eastern shore, dating to well before the 15th century. 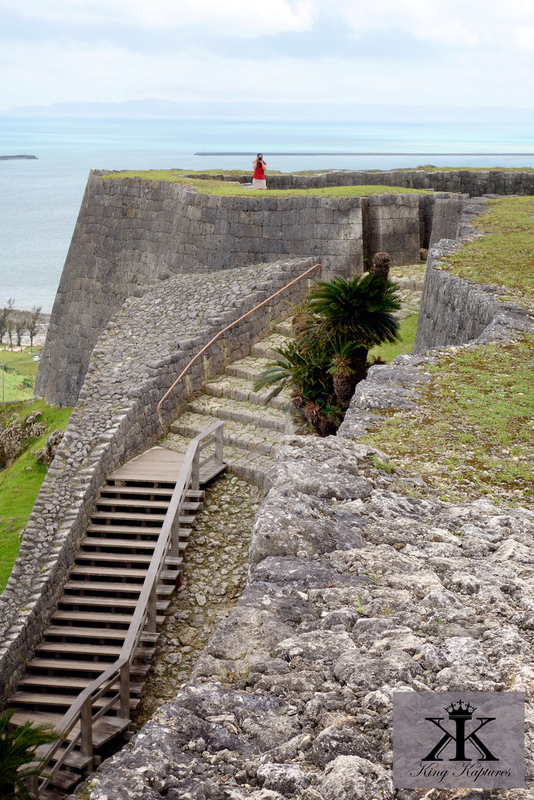 Katsuren Castle (勝連城 Katsuren-gusuku), also Katsuren-jō, is known in the Okinawan language as Kacchin Gusuku. 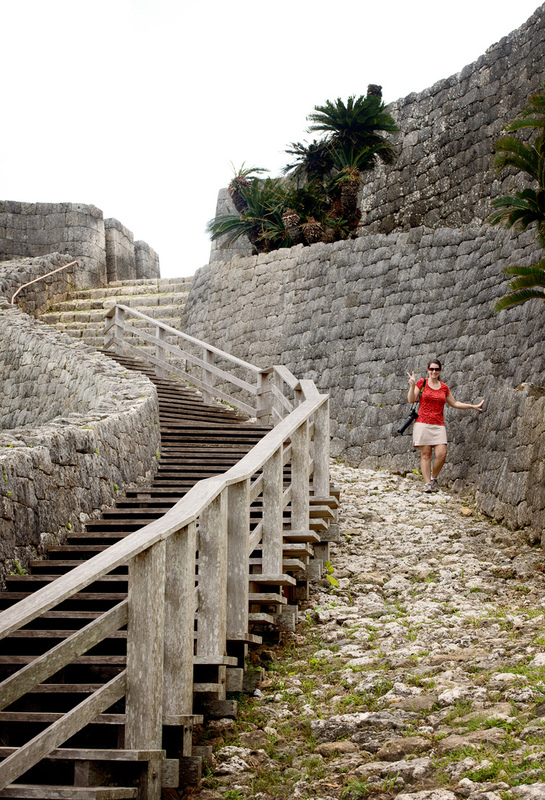 Katsuren Castle was built on a large hill of Ryukyuan limestone, 322 feet above sea level on the Katsuren Peninsula of Okinawa. 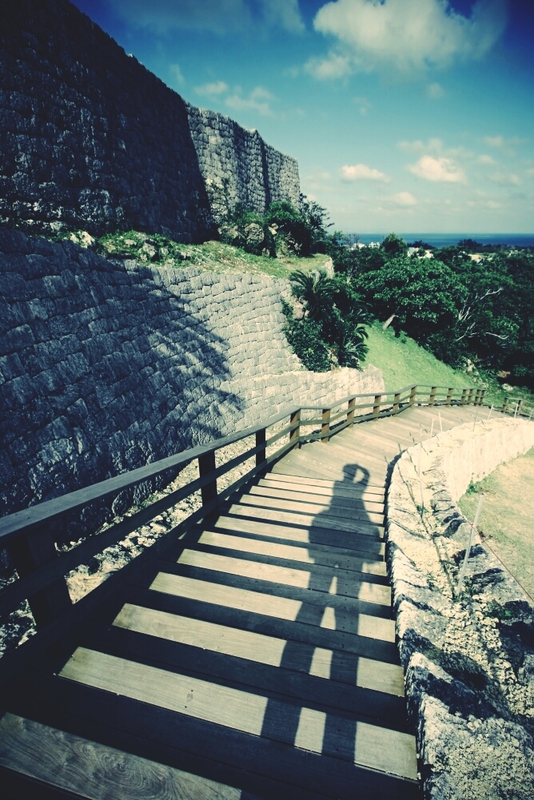 Not surprisingly, the castle offers magnificent panoramic views of the East China Sea and the Pacific Ocean. 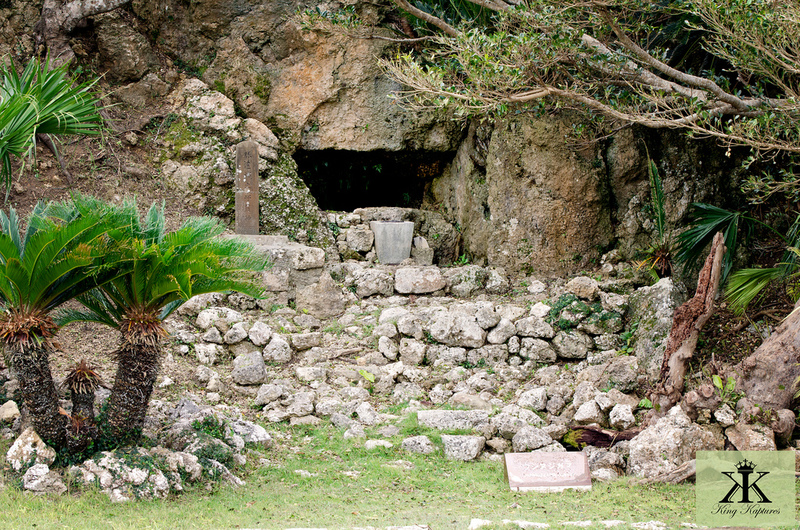 With water on two sides, it is sometimes referred to as the “Ocean Gusuku.” As a sacred site the castle contains a shrine of the Ryukyuan religion dedicated to Kobazukasa. Its walls, although massive and timeless, couldn’t contain the intense royal intrigue brewing there. 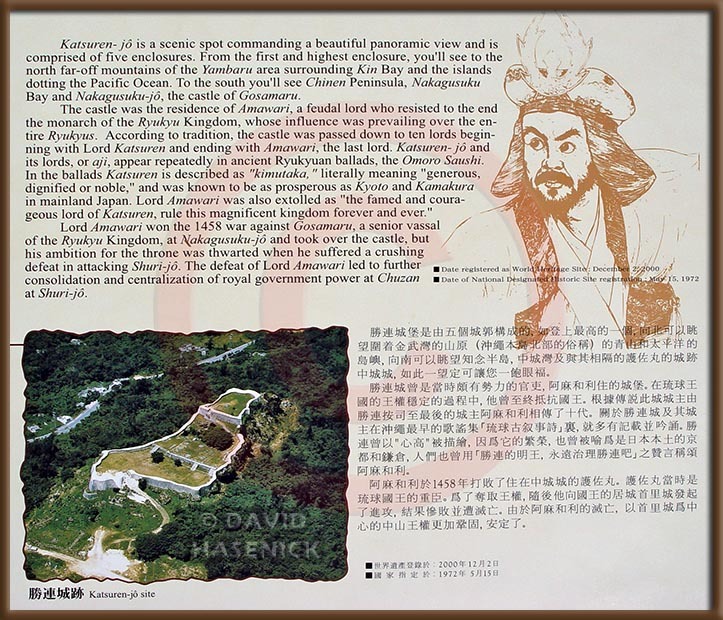 According to rich legend and some historical accounting, King Sho Hashi considered the regional chieftain named Lord Aji Amawari of Katsuren, the 10th Lord in succession of Katsuren castle, a powerful rival. Famous for fostering prosperous international trade, Amawari was also known as a cunning and politicized leader. 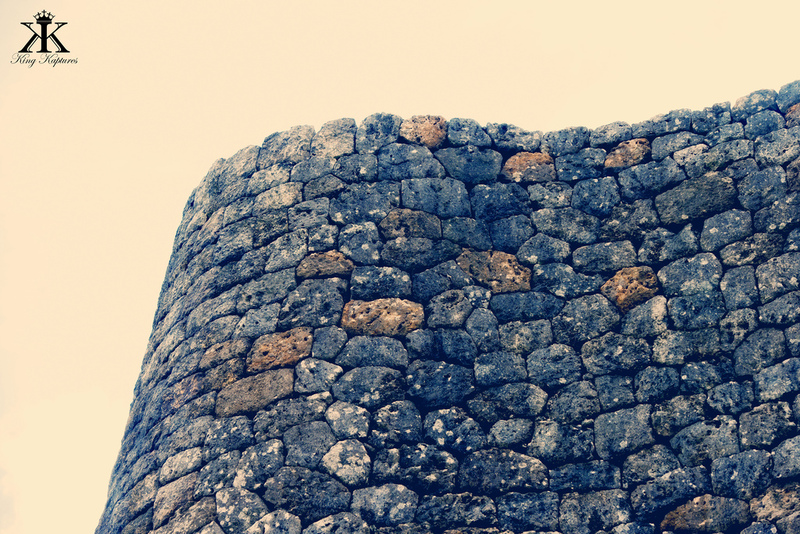 Legend has it that he pushed his predecessor, the 9th Katsuren Castle Lord, Lord Mochizuki Aji, off the top of the castle walls. As Aji was considered a tyrant and was detested by the people, not only did Amawari assume Lordship, he also became a popular savior to the people of Katsuren. King Hashi sent his daughter, matchless beauty Momoto Fumiagari, to marry the young Lord Amawari, as one means to keep Amawari in check. Ah, I hear you sigh, a tale as old as time as lovers’ intrigue generally leads to ruin. 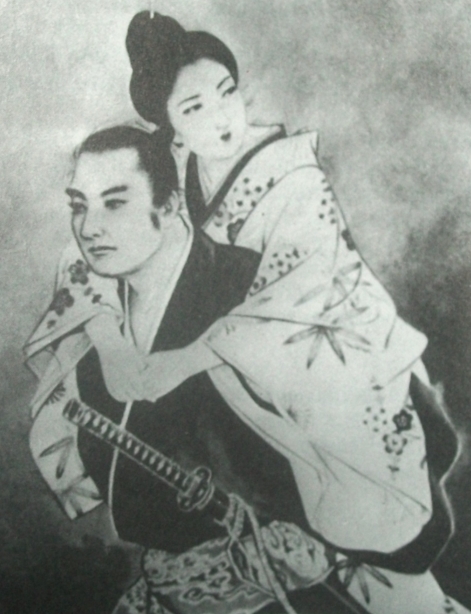 But as Awamari’s strength and popularity continued to grow, Hashi then moved his faithful disciple Lord Gosamaru, from Zakimi Castle in the north, to Nakagusuku, just south of Katsuren, to keep a watchful eye on his ambitious son-in-law. Amawari, whose dream was to unify the island under his control, eventually attacked and killed Gosamaru (with Shuri’s support), and then attempted to overthrow King Sho (of Shuri), but was defeated and killed in 1458. However, like in the genesis of all legends where truth is lost to time, the people of Katsuren today sees things quite differently. Amawari, popular among and compassionate to his people at the time, was a great threat to the King, and thus it was the King who held the hidden agenda. In another example of revisionist history, the characterization of Amawari is being slowly transformed from one of traitor to hero. Funny what a few centuries can do to rehabilitate just about anyone’s character. 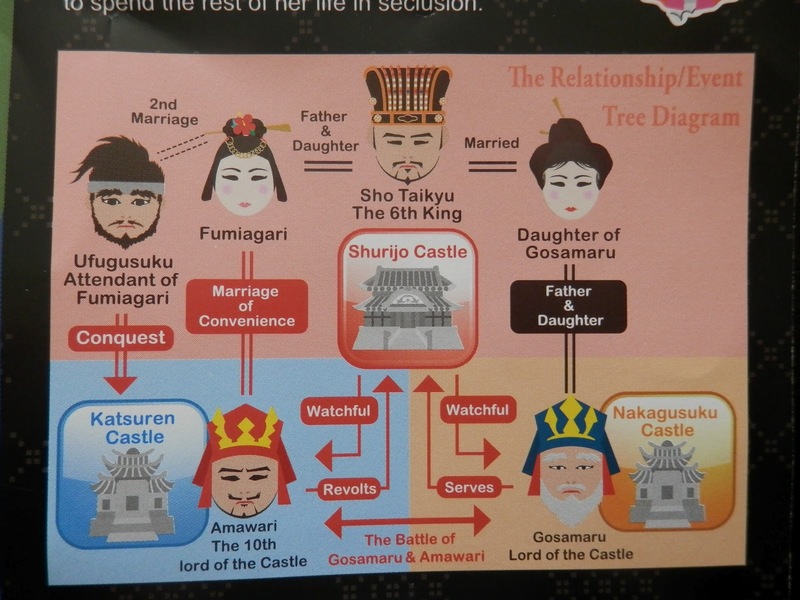 In any case, the 10th Lord of Katsuren Castle, Lord Amawari, was abruptly killed in some sort of politically charged spat, no doubt involving the rivals of Nakagusuku and Shuri castles. Oh, and surely over the girl (wink). He was the last powerful personality to infect Katsuren, and the castle slowly fell out of favor and into slow decay. The castle has 4 enclosures, each at a differing elevation. The first is relatively open, with the castle’s walls there being actively rebuilt during our visit. The 3rd Enclosure, going from bottom to top, is most likely where ceremonies and rituals took place. Moving up the large wooden staircase to the 2nd Enclosure, visitors find the foundation of a massive pillared building as grand and on par with Shurijo stood here, based on fragments of expensive Chinese and Korean pottery and colorful architectural decorations. This level served as the core of the castle where the Lord and his Lady resided, and, in effect, served as the public “government” offices for the region. Moving up some stone stairs to the uppermost 1st Enclosure, one finds the best views and smallest space, used for the safe repository of valuables according to most speculation. 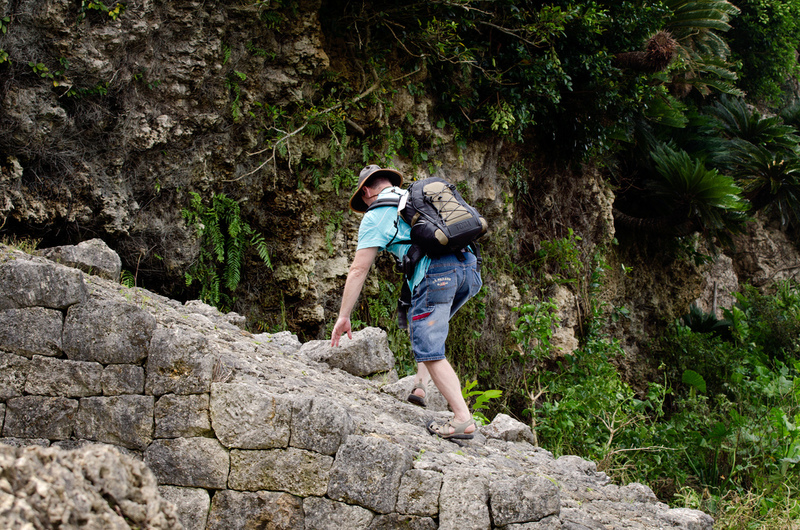 The journey to the ruin’s highest level can be completed (mostly) via the modern, handsome and sturdy wooden staircase, but you may also elect the more authentic and exciting journey up the crumbly rock ramp that is immediately adjacent. Be forewarned though, this is not the day to be wearing your laid-pack island-time flip-flops; sturdy shoes for this adventure are a must. 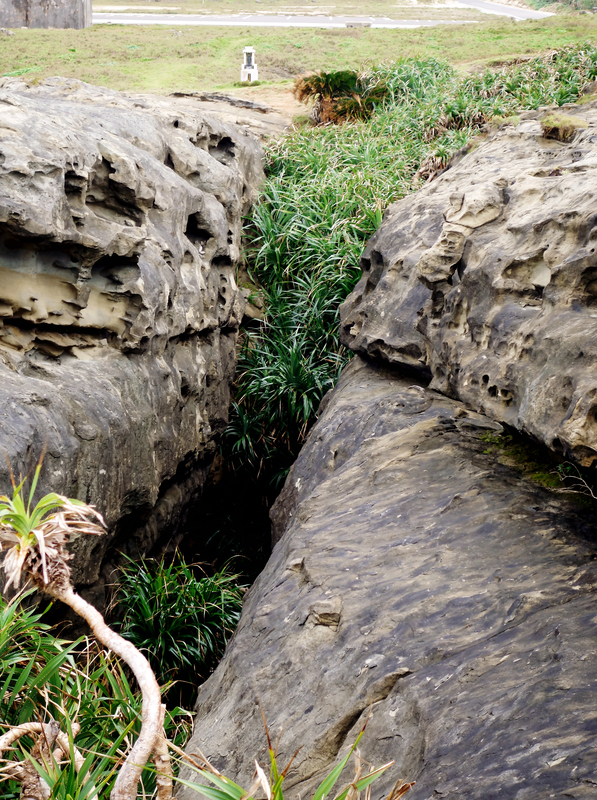 The limestone is jagged and especially slippery when wet. As a religious site, Katsuren is still very active. 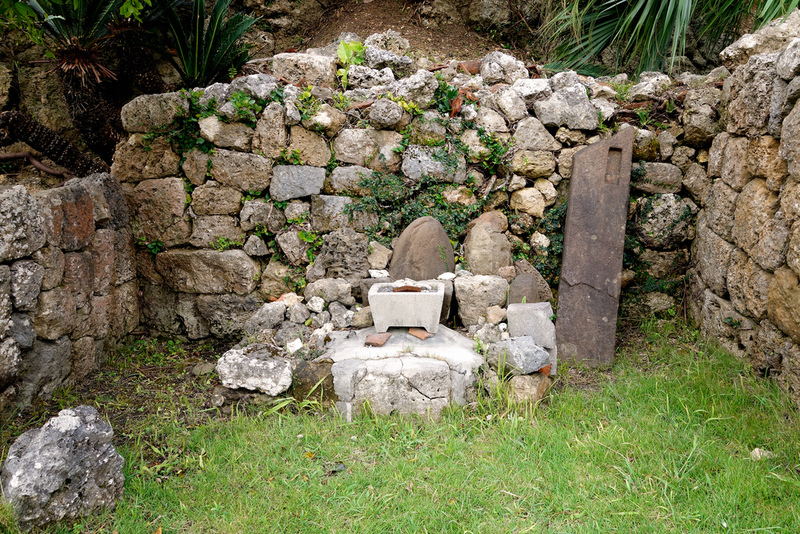 Numerous gods were worshipped in ancient Okinawa, believed to protect the island and the Okinawans in daily life, and many of those are still worshiped today. 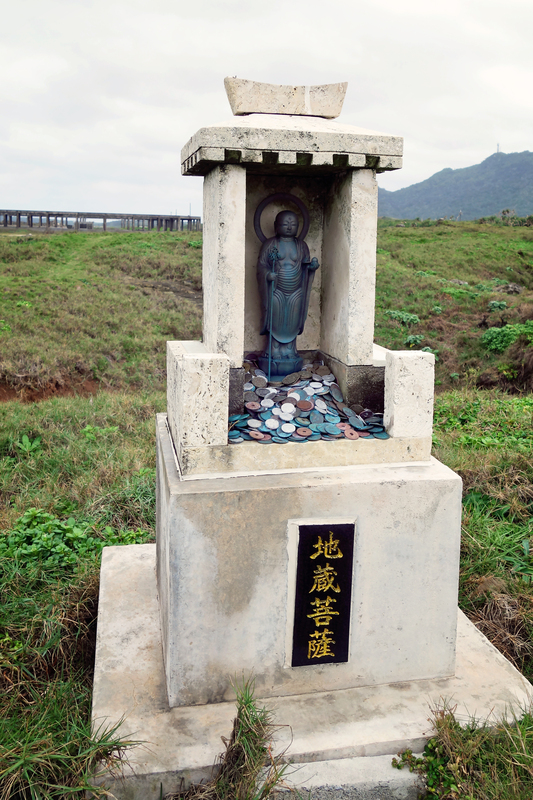 Not surprisingly, there are a few altars at Katsuren, which continue to protect the castle and region. 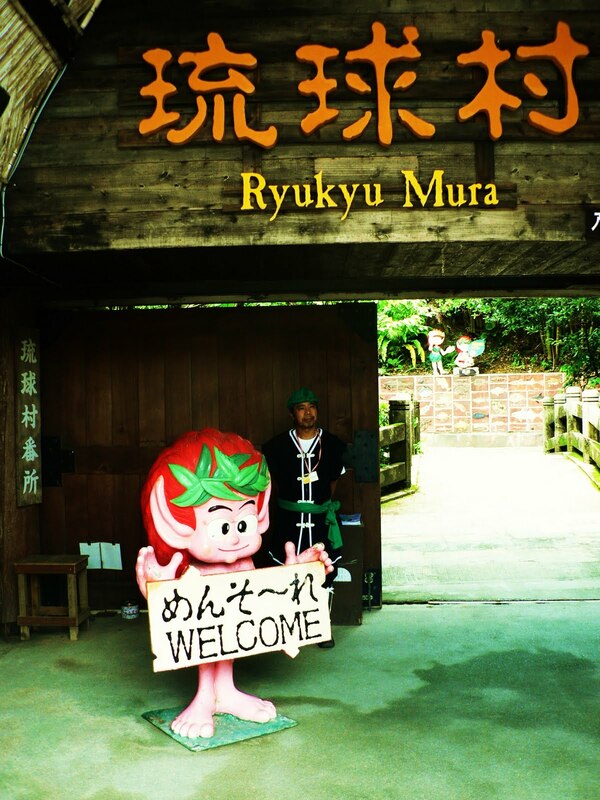 Interestingly, the castle’s kitchen also is the site of the Altar of Umichimun, the Ryukyu God of Fire. The grounds also hold an entrance to a cave called Ushinujigama (”gama” means cave), which was most likely used as a refuge during war and natural disasters. 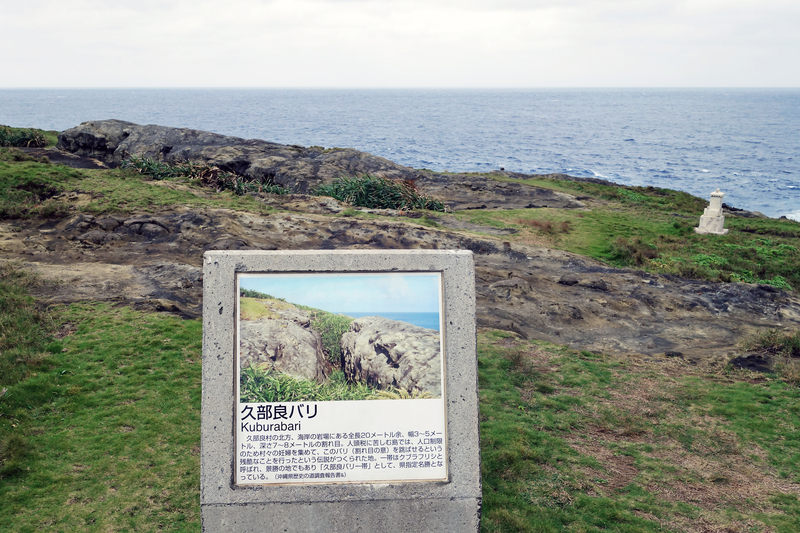 Finally, the Tamanomiuji-utaki stone at Katsuren Castle serves as a sacred shrine. 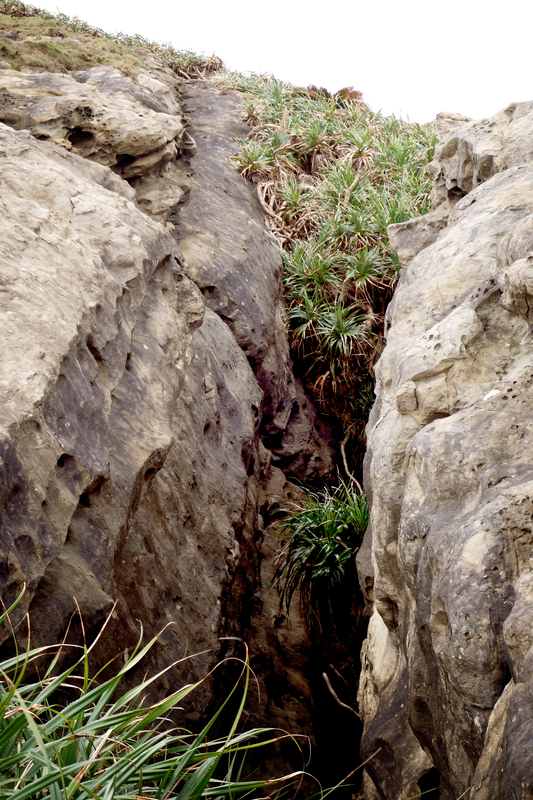 This stone remains an active place of worship, and is believed to connect underground to Ushinujigama, connecting two sacred sites together. 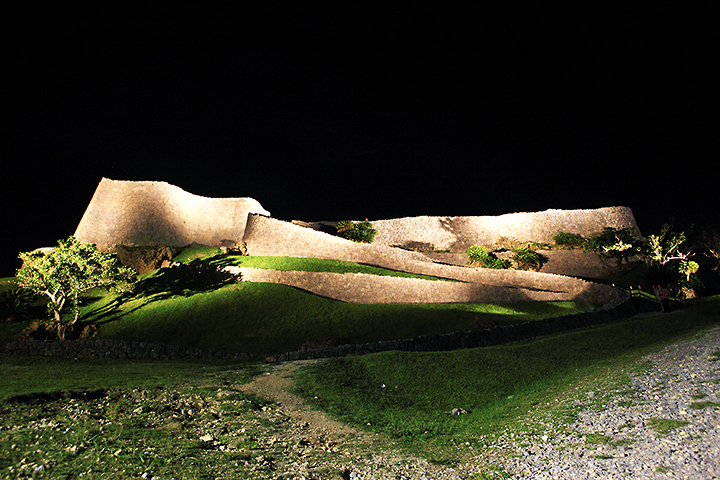 Katsuren Castle was designated a UNESCO World Heritage Site in 2000, and is one of the nine Gusuku Sites and Related Properties of the Kingdom of Ryukyu. 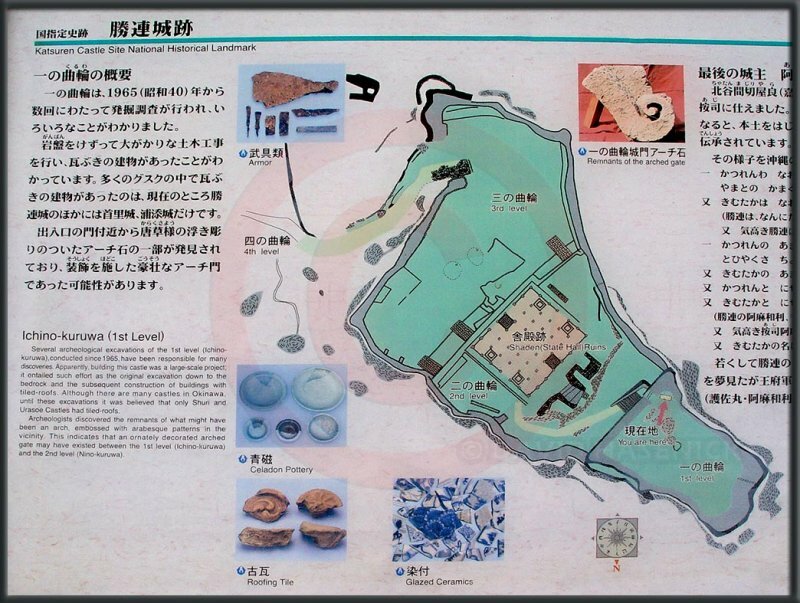 It was also declared a Designated Historical Monument (史跡 Shiseki) by the Japanese Agency for Cultural Affairs in 1972. 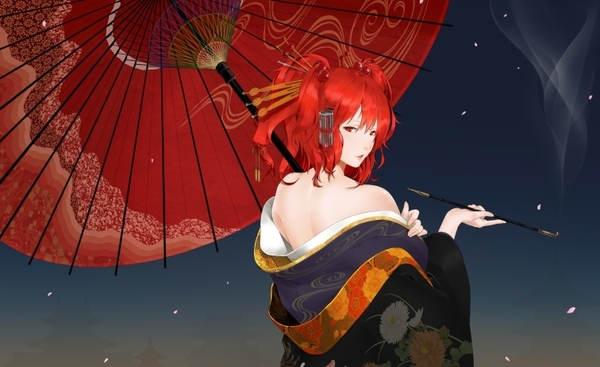 Although the wrong wife can lead to the ruin of her husband, hopefully you can visit Katsuren with a mate more well-suited. And maybe, just maybe she won’t have a power-hungry father with an army at his disposal. More likely the long journey involving a couple of U-turns, poorly functioning air conditioning and perhaps and a man who won’t ask (or take) directions will be the origin of any relationship rift(s). Don’t be in a rush to physically get there, even though you have must visit this fascinating site. The drive there can be frustratingly slow. Nevertheless, it can be made a scenic and relaxing ride. 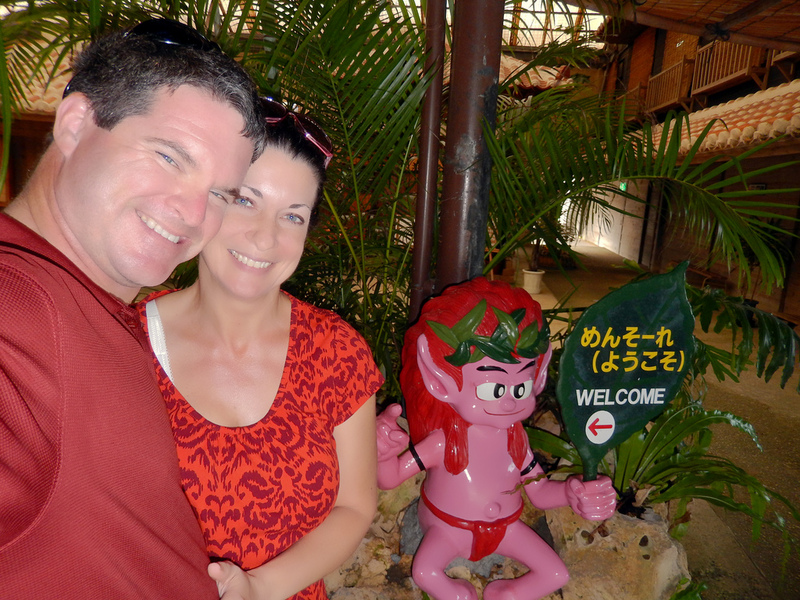 So adjust your clocks to Island Time, and take in some of the more rural areas of Okinawan on your way. I have a good one. Spouse, I mean. But just keep one eye on that spouse of yours…. 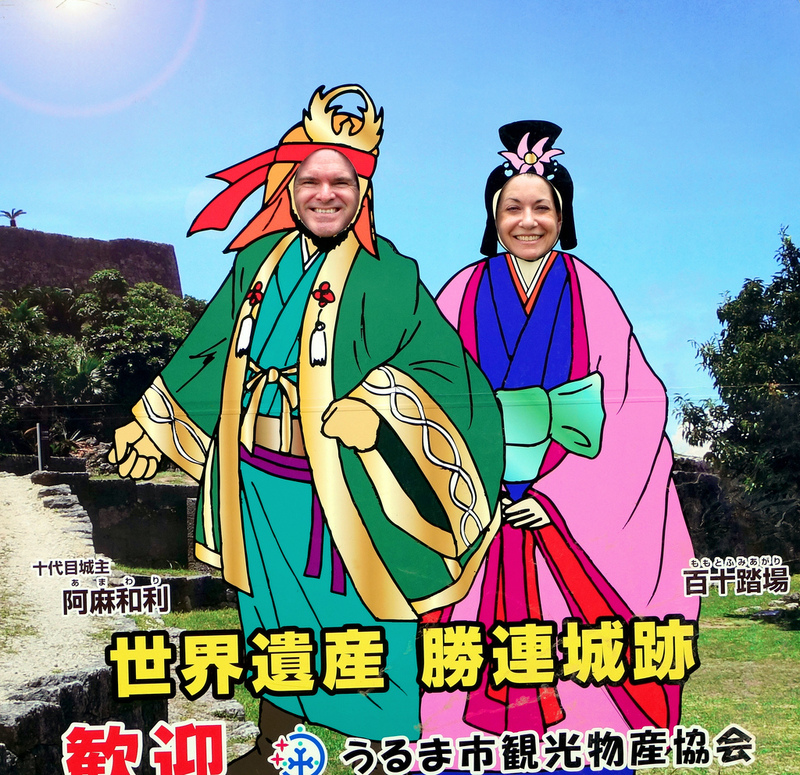 You never know what schemes may be hatched with the rich Ryukyu Kingdom history and colorful intrigue as their guide! Open: Closed Mondays and December 29th – January 3rd. Directions: Exit the Okinawa Expressway at Okinawa Minami and make a left onto Highway 23. At the Ikento intersection turn right onto Route 16. Follow the road straight for several kilometers (be patient – it takes longer than you think or want!) until the roads starts uphill as it gently curves left ninety degrees. 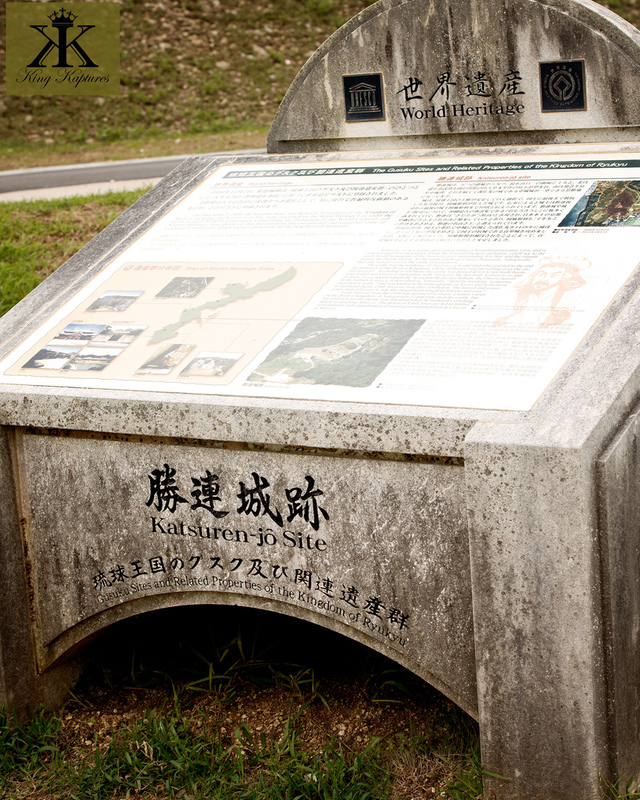 Just after the road curves, you’ll find a sign pointing to the Katsuren Castle ruins on the right, with the museum and parking area on the left. Red hair appears in people with two copies of a recessive gene on chromosome 16 which causes a mutation in the MC1R protein. At least that’s what scientists want you to believe. 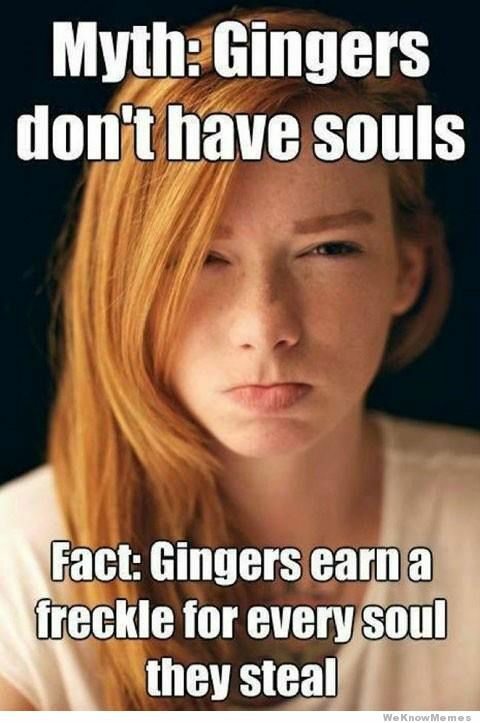 Red hair is really because such people are born soulless…. 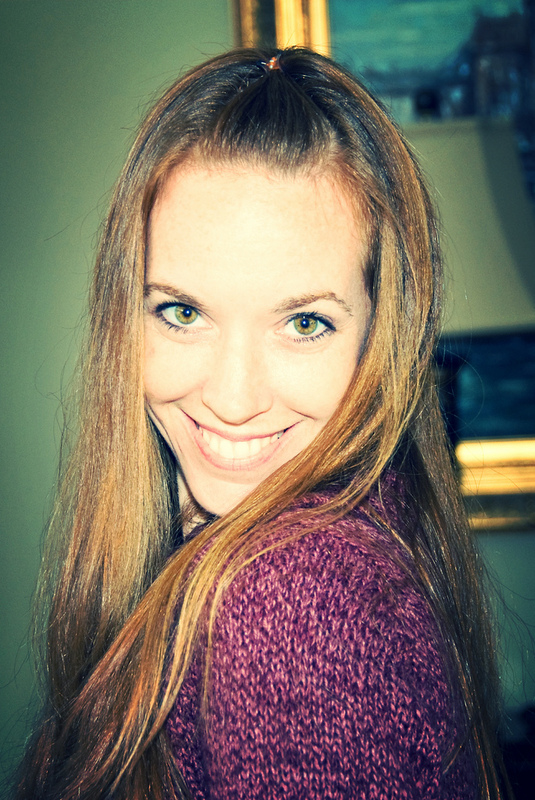 Now, I can say this (and other things about redheads), without fear of repercussion or reprisal. You see, I have some near and dear Gingers in my very own family: my beloved cousins Suzanne, Cindy, and her daughter, Alina. I can assure you, besides being three of the prettiest women I know and being some of the very best human beings on the planet, they all have souls. Not sure if they were there at birth though (wink). 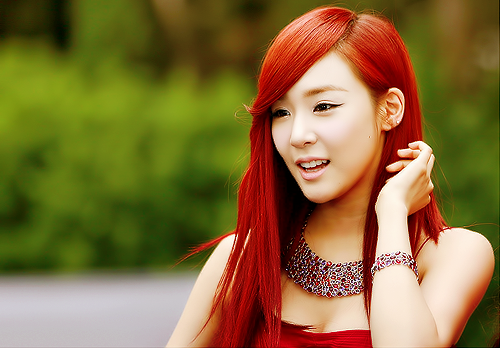 Red hair occurs naturally in only 1–2% of the humanity, and occurs more frequently (2–6%) in people of northern or western European ancestry, and less frequently in other populations – like those of Asia. 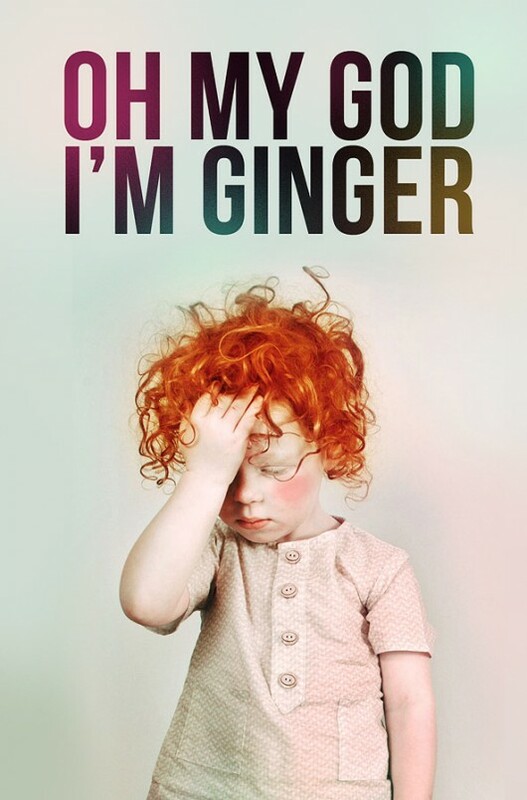 Scotland, Ireland, Wales and England have the most redheads. 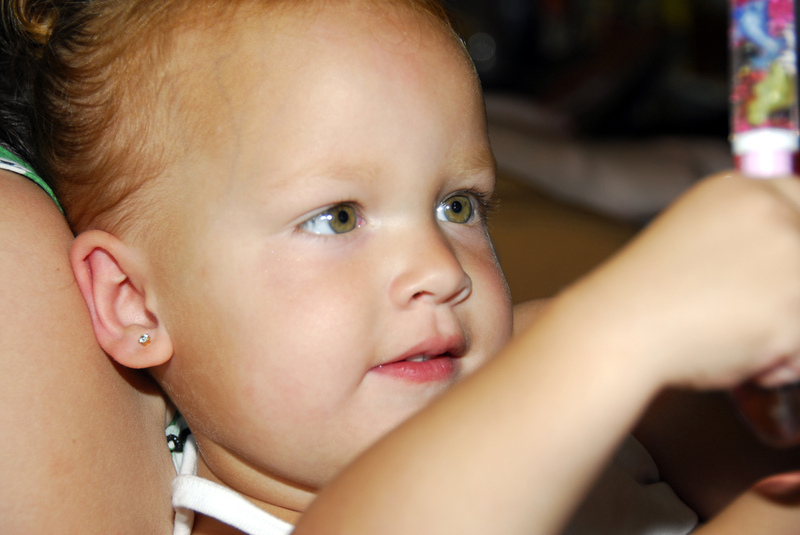 Scotland leads with 13% having red hair and ~40% possessing the recessive redhead gene. Ireland is next with ~10% redheads, and ~40% carrying the gene. The U.S. of A is harder to gauge, but let’s take the average of the estimates and say ~4%, which, in total numbers, gives the United States the largest redheaded population at about 12 million. Now that’s some Red Power! In the Far East, flings with genetically-based red hair are rare, and can really only be found in the Levant, Turkey, the Caucuses, Northern Kazakhstan, and among Indo-Iranians. The use of henna on hair, along with more modern western hair dyes, are both common in Asia, even if red hair isn’t. However, such dyes result in various rather unnatural shades of red. That’s *probably* not her natural hair coloring…. 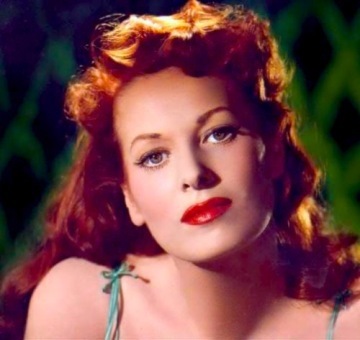 Throughout history, redheads – “ginger,” “auburn,” and “strawberry blonde” – have been feared and revered, loathed and adored, degraded and exalted. No other single human trait has provoked such a dichotomy of feverish emotions in so many others. 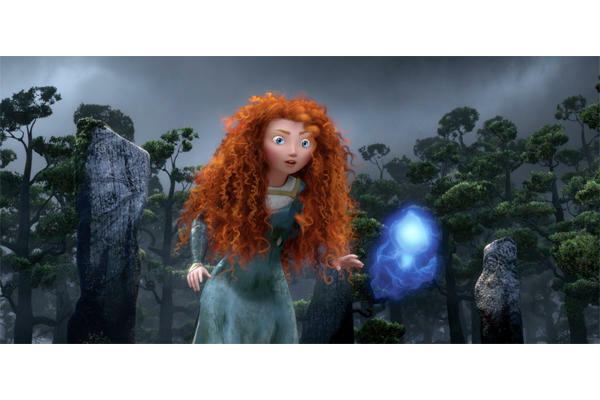 Prejudice and suspicion has always confronted the redhead, along with an almost worldwide belief of fiery temperament, an artifact of the Scots and Celts being such fierce and notoriously violent warriors. 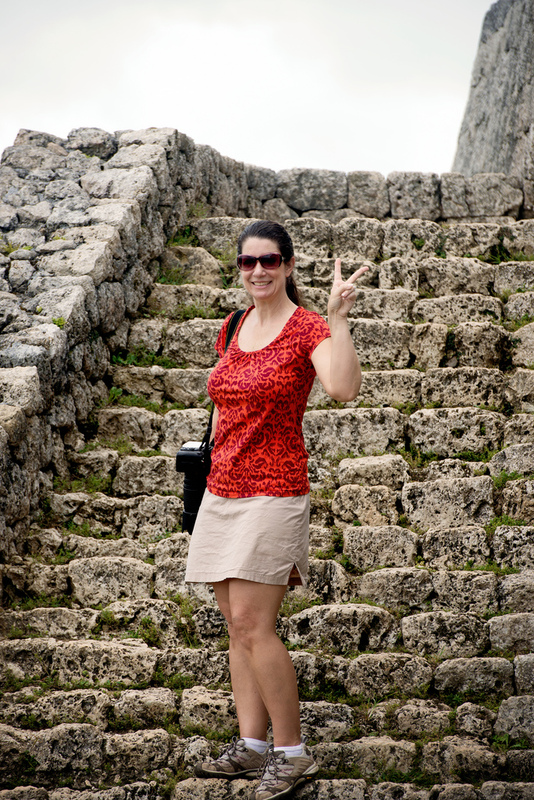 And things appear not much different here in Okinawa…. Only a redhead would turn her own mother into a bear. 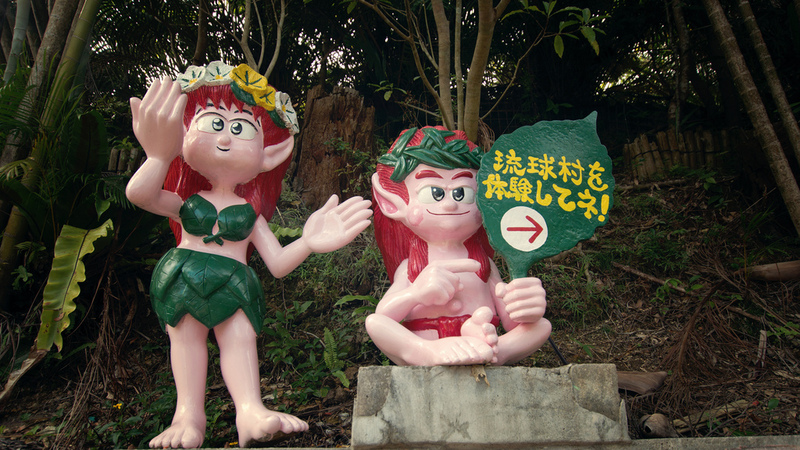 The Kijimuna (キジムナー) are well-known wood and tree spirits, sprites or fairies of Okinawan mythology native only to the Ryukyu Islands. 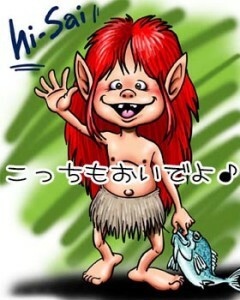 They are said to look around three or four years old and covered in red hair. 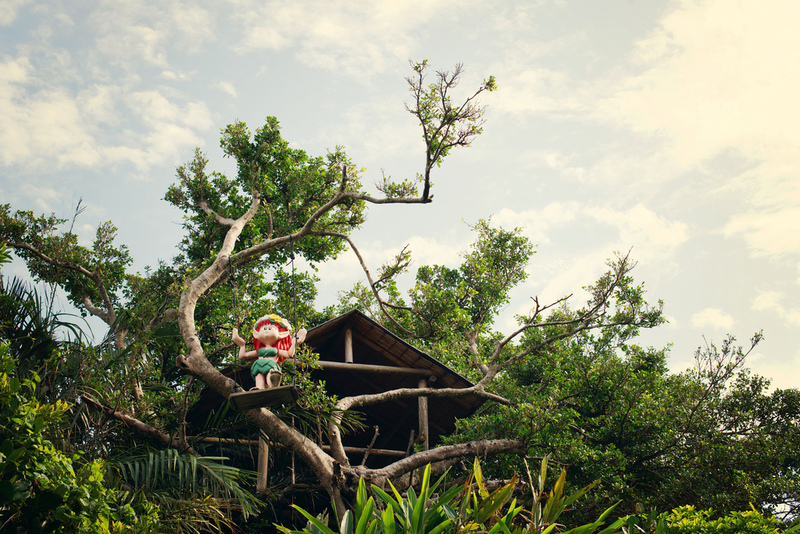 They are believed to live in trees, most commonly large banyans called gajumaru, which gives such trees a rather special place in Okinawan’s hearts. In fact, my first time on Okinawa, in 1999, an officer I was stationed with here was having serious plumbing problems in the home he was renting not far from where we elected to live out in town. When the plumber’s reports were finally translated, it was found that the large banyan tree in their tiny yard had expressed its roots all through the home’s underground plumbing. 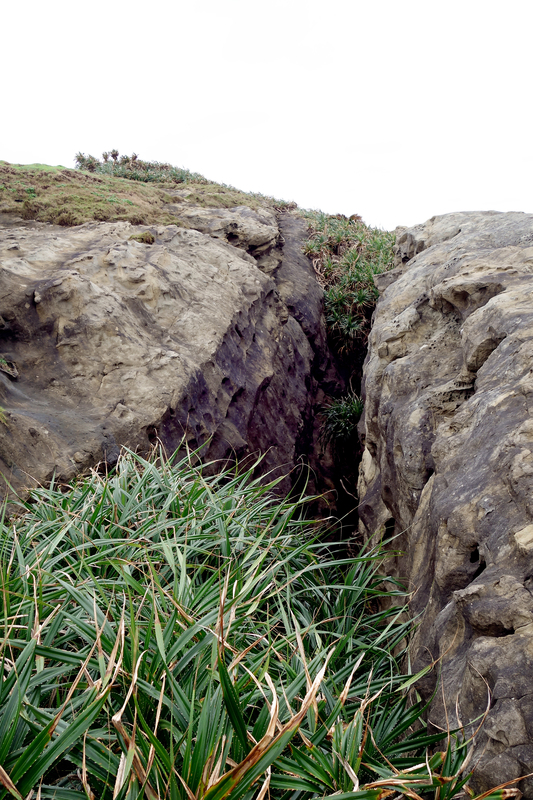 When we in the west would most likely haul up and out a tree causing such problems, here in Okinawa, such a course of action was simply out-of-the-question: the tree would stay; the innards of the house would be dug up instead. 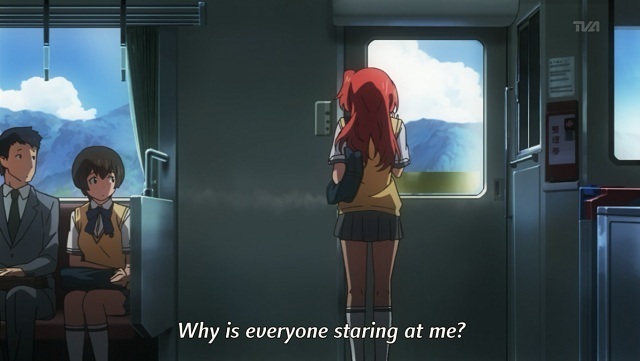 You know, least they disturb and anger the Kijimuna…. To keep the spirits in the trees, however, many such gajumaru near homes and schools will have nails driven into their trunks. It appears this one used the nails…to build a home. 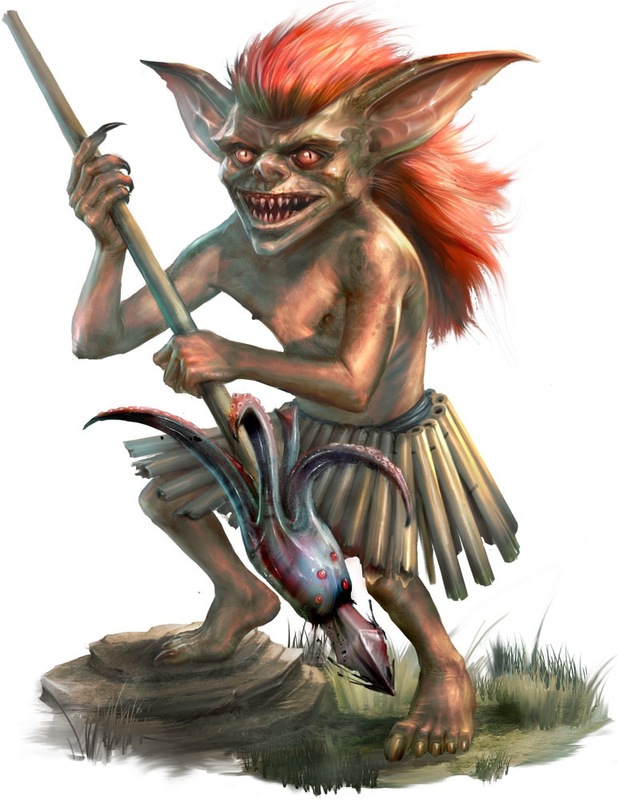 ijimuna are described as being child-sized, they are said to have unusually large heads topped with red hair, which sometimes covers their whole bodies. 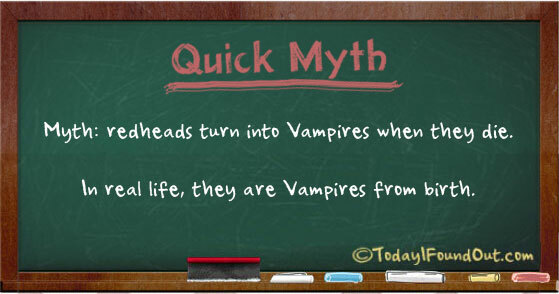 Often they are depicted as being red all over, hairy or not. Being excellent fishermen, they only eat the left eyes of their easy and abundant catch. 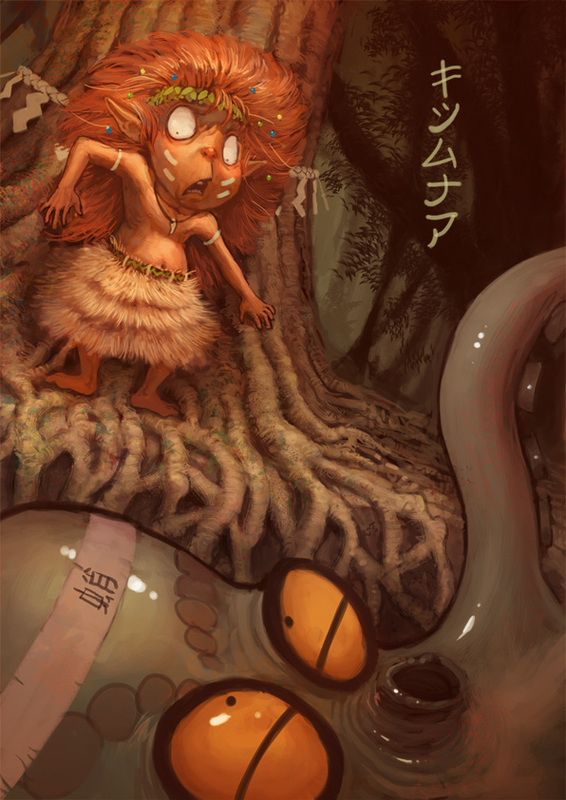 Another name for the kijimuna is bungaya, which means roughly “Large-Headed.” The Kijimuna can be very mischievous, playing pranks on and tricking humans, but are generally innocent and friendly. A Different Perspective on Kijimuna. They really dislike octopi…. One of their most well-known tricks is to lie upon a person’s chest, making them unable to move or breathe, a condition known as kanashibari. And even though they have been known to make friends with humans, such relationships don’t last and often go sour. The kijimuna dislike people passing gas while riding on their backs (as odd as that sounds), and absolutely hate octopus, with which humans often have to drive kijimuna away after relationships have turned! 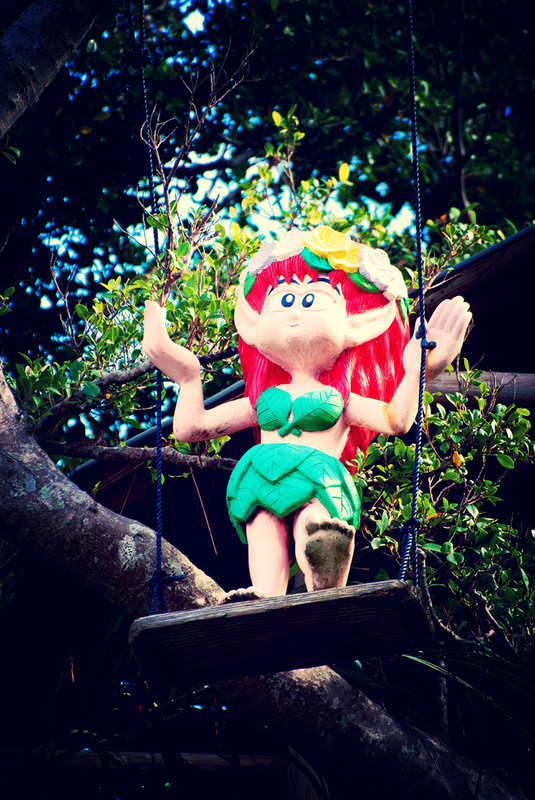 Such beliefs related to redheads do seem to permeate many cultures. The ancient Egyptians played both sides, exalting many redheaded pharaohs while burning gingered-maidens. 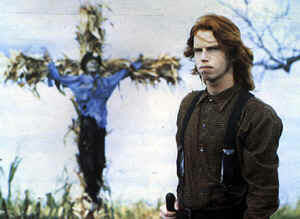 The Greeks believed that redheads became vampires at death; isn’t that the plot of varied and highly successful teenybopper movies of late? The Romans paid a premium for red-haired slaves, a symbol of strength and vitality. During the Spanish Inquisition, known for its objective due process and impartial judges, red hair was literal evidence of hell’s fire, and usually was extinguished by being burned as a witch. In the Middle Ages – not a rich period of enlightenment, redheads were associated with the Devil; it was thought that a child born with red hair was conceived during a woman’s “time of the month…”. How silly; astrologers have all but proved that it’s primarily due to the undue influence of Mars-rising…. Biblically speaking, red figures supremely. The Hebrew “Adam” can mean “to be red” or “ruddy,” but in all fairness this probably refers to skin color rather than hair. Judas Priest – not the band, but the original poster boy of zealotry gone bad, sometimes has red hair. And, the original bad gurl Mary Magdalene is often portrayed the same way (but with no biblical reference to her hair color). Similarly, red hair has been thought to be a mark of a beastly sexual desire and moral degeneration, both positives in my ‘lil black book…which if they came in red I’d own one. 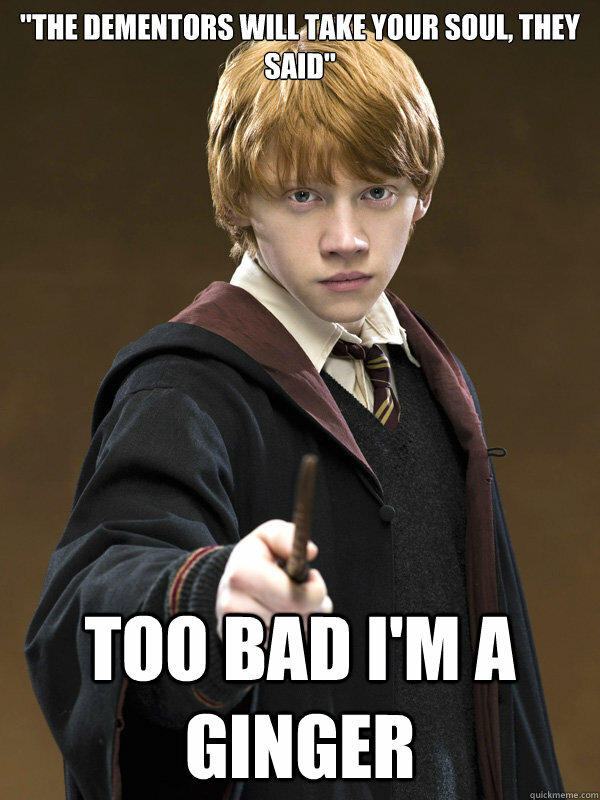 It is a common belief that redheads are highly sexed. Oh behave! 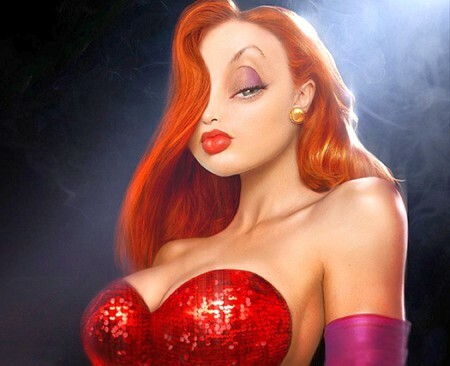 Are redheads bad, or are they just drawn that way?? Of course anything seen as evil in the world couldn’t be comprehensively described without some reference to the Nazi’s, who, as the logical stewards of developing the master race felt that ginger-kids shouldn’t wed or reproduce. Too late. A breeding pair. Such beliefs, if unchecked, can give rise to “gingerphobia” (fear of redheads) or “gingerism” (prejudiced against redheads). 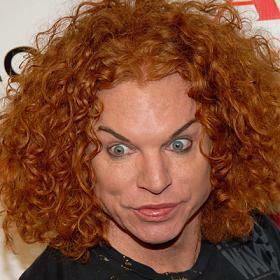 Redheads are sometimes disparaged with the moniker “carrot-top,” and for one, it seems discretely applicable. So, if clichés are to be believed, while brunettes may be smarter, and blondes may have more fun, neither are wrapped so tightly in mystery and intrigue that they become an enigma enveloped within an enigma. And, in an ironic twist of time and Mother Nature, most redheads go from red to blonde to white, with hardly ever a grey hair to show. 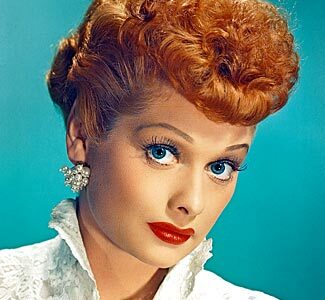 So, while the rest of you color-challenged cohorts start covering your grey in your 30s or 40s, those redheads that have been the center of so much drama will remain gorgeous, but with time, as strawberry blondes. Karma is a wonderful thing. 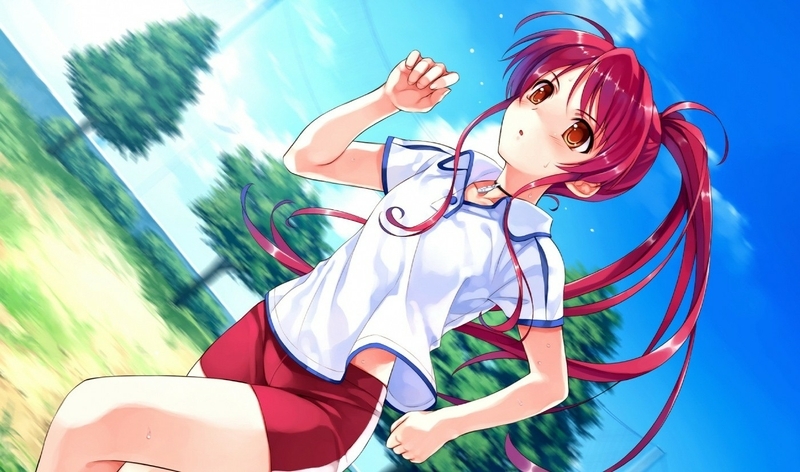 The kijimuna however, do not age. And as long as there are flourishing banyan trees and tall-tale telling grandmothers in Okinawa – less any proximity to octopi – the bungaya will live on, fiery as ever, forever. 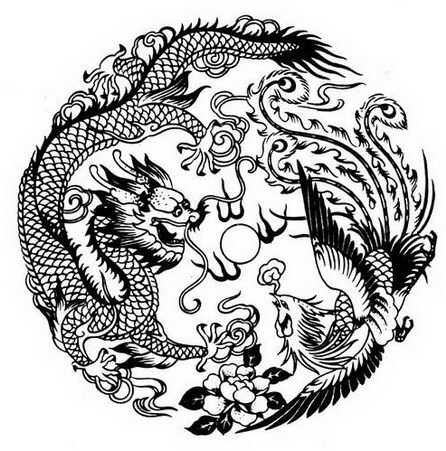 The Arabian-Western phoenix we are all familiar with has a close analogy in Asia. 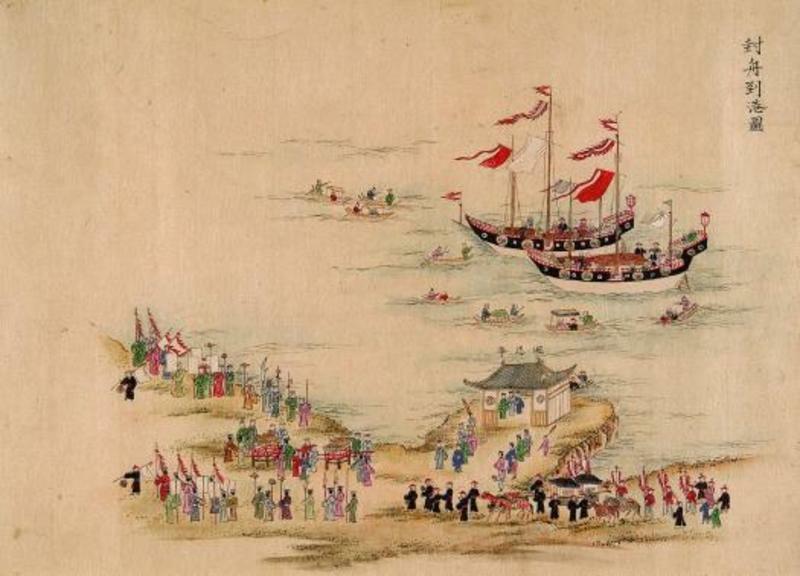 Dating in China from the 11th Century BC, the Chinese Far East Phoenix is known as Fèng Huáng or Feng Huang (鳳凰), and in Japan, the creature is referred to as the Hō-ō (鳳凰) or Hou-ou. 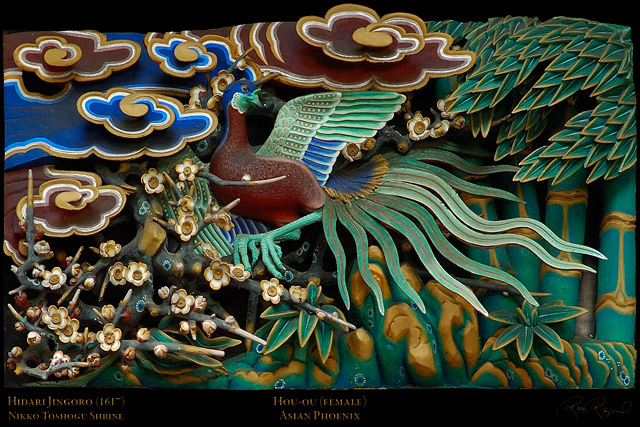 The Kanji for “Phoenix” is made up of Feng 鳳 representing the male phoenix, yang and the sun, alongside Huang 凰 representing the female phoenix, yin, and the moon. 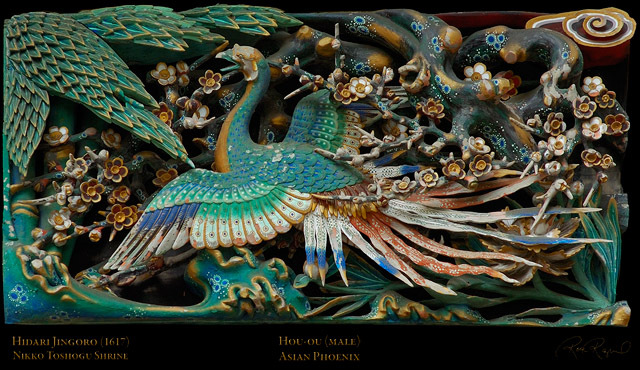 In Asia, the (female) Phoenix is often portrayed with a (male) dragon, either as mortal enemies or as blissful lovers, the duality of roles adopted by couples at varying points in their relationships. Adopted as the symbol of the imperial household, particularly the empress, this mythical bird represents, in general, fire, sun, justice, obedience, and fidelity. According to legend (mostly from China), the Hō-ō appears very rarely, and only to mark the beginning of a new era — the birth of a virtuous ruler, for example. In other traditions, the Hō-ō appears (nesting) only in peaceful and prosperous times, and hides itself when there is trouble. As the herald of a new age, the Hō-ō descends from heaven to earth to do good deeds, and then it returns to its celestial abode to wait the start of the next, new time. I am inked, and inked with a Far East Phoenix. My original tat is of origins and impregnation while stationed previously in Okinawa (Japan), with a genesis that took years to finally coalesce (read about it here: Tattoo You? Absolutely). Although my ink is positioned to avoid daily public exposure and consumption (generally speaking), it is also positioned so that I, for often long periods of time, forget about it…as odd as that sounds)…until…someone asks me about it. 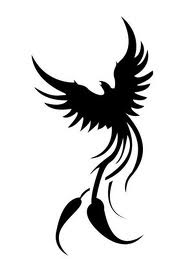 Or my wife has to scratch that certain spot of my back which happens to coincide with the Phoenix’s tail, which can result in Nirvana (I think everyone should have an itch and spot like this)! Only then is its presence reaffirmed in my psyche, and more often than not, I’m only too happy to share my story (usually abridged, depending on the audience). 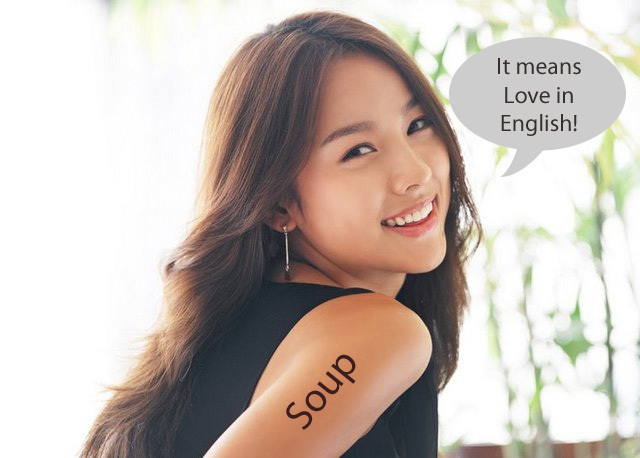 That’s the whole point of a tattoo, isn’t it? To graphically tell a personal story? A temporary tat I got in 1999 to freak my mother out! It worked…. Which brings me to an interesting tangent. How many of you out there know someone who has a rather generic or dare I say “mundane” tattoo? 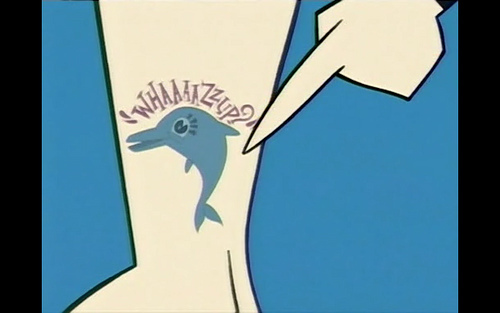 You know the kind I’m talking about: the dolphin on the ankle, or the rose on the shoulder-blade, or worse, some form of Asian kanji writing anywhere on the body…. I bet if you stop and really take stock and inventory, you can come up with at least two or three people, given the popularity of tattooing today. This can be a fascinating insight to these particular people: if one is not going to take great care and great pains on placing permanent art on one’s most personal and irreplaceable canvas, what other areas of life come (and go) so easily? I considered Bettie Page for a long time. What a silly story that would’ve made! By the way, a word of caution here: after having lived in Japan for my 6th year, and having seen how badly and hilariously English and Japanese can be translated back and forth, please take a moment or three decades to reconsider that kanji character you have so badly been wanting (see here). 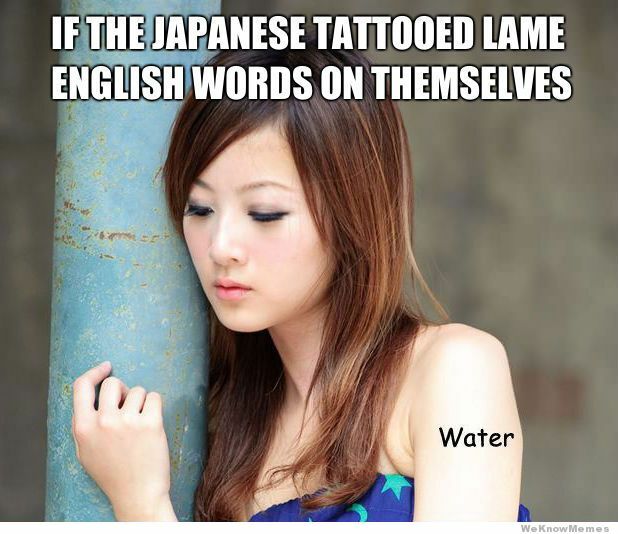 Or, to make this much more plain, look at how silly pedestrian English words would appear as tattoos on Asians…. ‘Nough said. But back to MY story surround MY ink. As you may recall from my previous blog on the subject, I was able to successfully translate conflicted and dark feelings into permanent art to adorn my body, initially back in 2005. 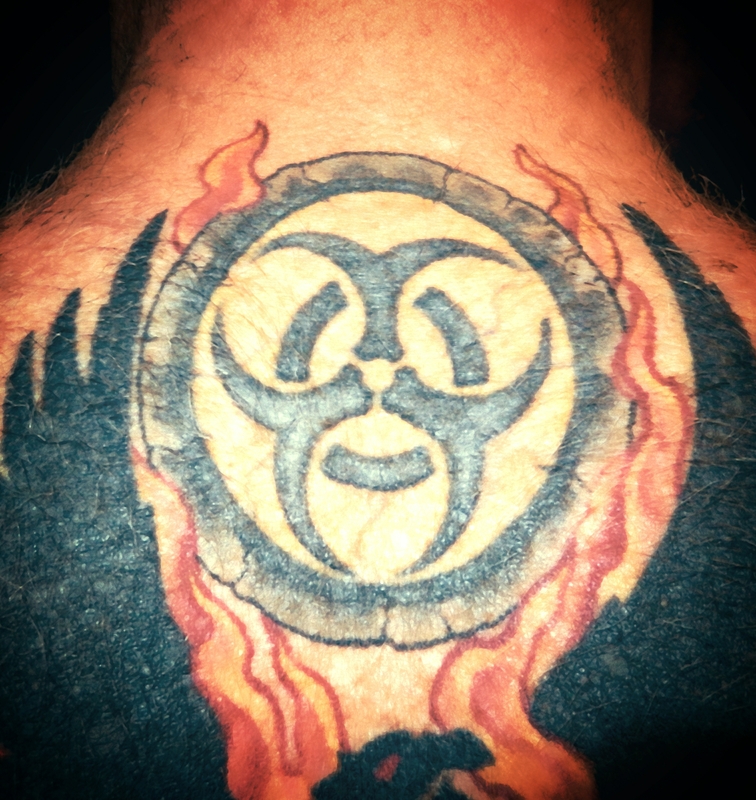 The biohazard design I ended up selecting symbolized such feelings succinctly, yet in a way that translated directly onto my skin. The biohazard motif I had settled firmly on held the central idea of man being his own worst enemy, but also could so easily be extended to include those wars, conflicts and smaller upheavals we all find omnipresent in our daily lives. However, what started as a personal yet metaphysical conflict mostly within myself quickly morphed into a wider outside battle at the time my ink started to dry, philosophically speaking, as my marriage was liquefying down the drain. Thus, my original tat became, somewhat on purpose but mostly a result of collateral damage, tied excessively to the pain and suffering of a disintegrating 16 year marriage and 18 year relationship. And although that original tat did serve as a visible mode of attaining a form and depth of corporeal catharsis, I reached a point in my life where I no longer wanted to forever and always associate the pain of ink with a past marriage which had, in totality, become toxic. Although these memories remain with me today, they certainly all have, at worst, faded, but at best, they have in many cases surrendered to exactly what most feelings are: a contemporary reflection of only a temporal phase of life. So, sometime after divorce in 2006 my consciousness started to almost immediately drift. 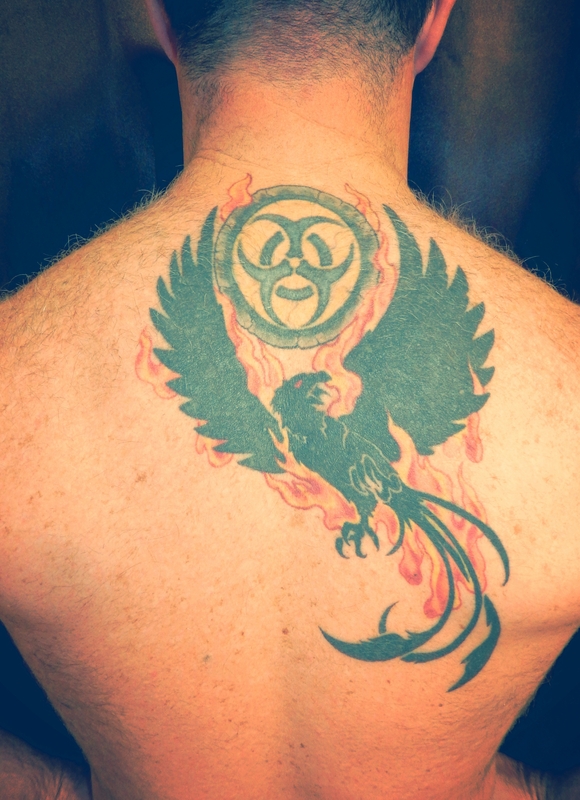 And finally, in roughly 2010, it had traveled far enough away from my initial viewpoint for me to again seek a change (for the better)…and new transformative ink, on top of the old. Bad Transformation; I’m not sure which one is worst! I started to re-research a refreshed approach to morphing my art to something which would better match my now-current story. 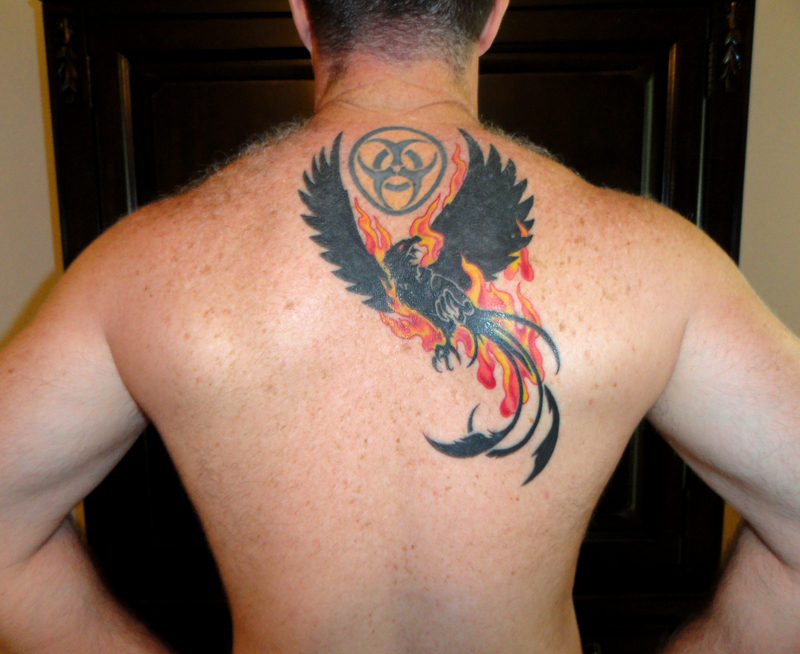 And that story is a much different story than that told by my ink back in 2005. I have recovered from emotional devastation of the destruction of a previous marriage, and the bitter betrayal of someone who once was loved and cherished. I have recovered from the financial disaster of divorce and the irresponsible deficit spending that followed; only just this month (January 2014), can I claim once again that I am debt-free, the first time since 2005…although the witch continues to get a portion of my military retirement. I have accepted the tragic loss of my status, influence and proximity as a father to my children during their adolescent years. 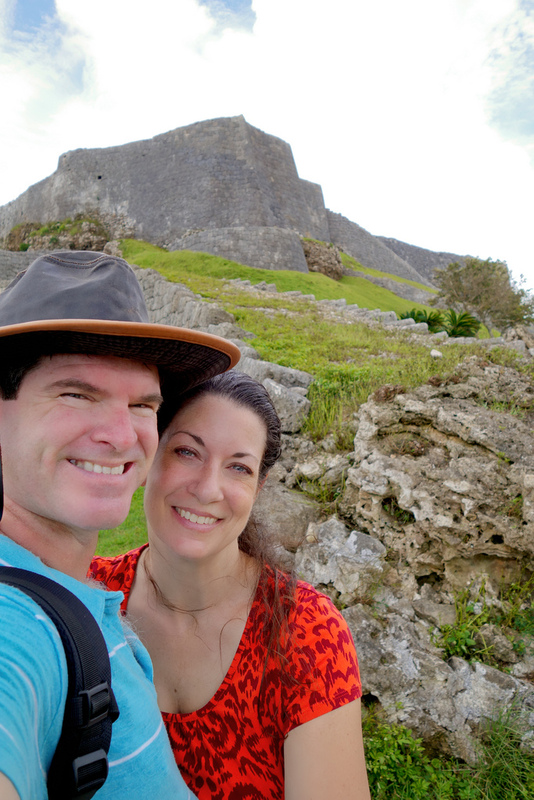 And, most importantly, I have found the love of my wife, a woman who is truly my equal (except for blogging – WINK! ), and who loves me easily and unconditionally the way we all deserve to be loved and equally cherished in life. So, again, the central question of inking: graphic design! My life has always revolved around flying, literally as long as I can remember. I am a pilot, flew in the military, and continue to skydive today. I also am enamored with myth and legend, particularly when it comes to their symbols and symbolism. 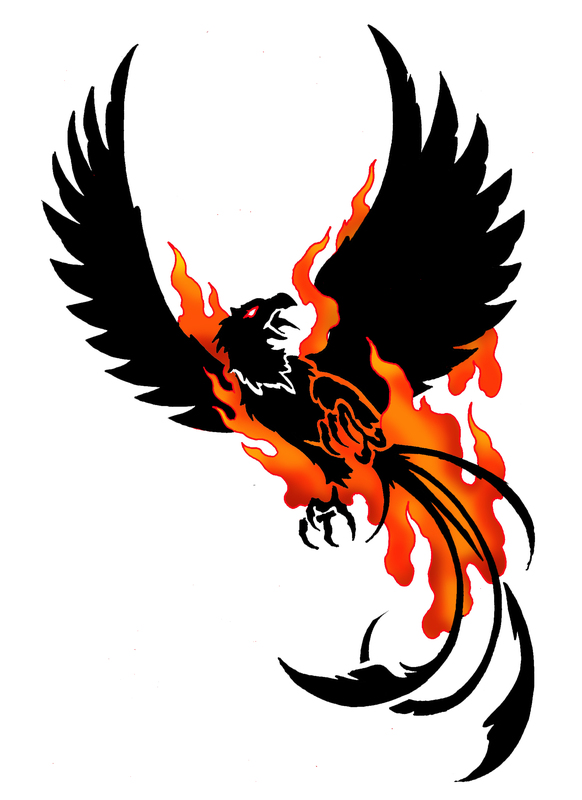 I almost immediately thought of integrating a Rising Phoenix into my biohazard symbol to show rebirth, resolution, resolve, and recovery. 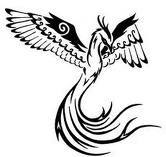 In Greek mythology, a phoenix (Ancient Greek φοίνιξ phóinīx) is a long-lived bird that is cyclically regenerated or reborn. Associated with the sun and most likely of Egyptian origin, a phoenix obtains new life by arising from the ashes of its predecessor. 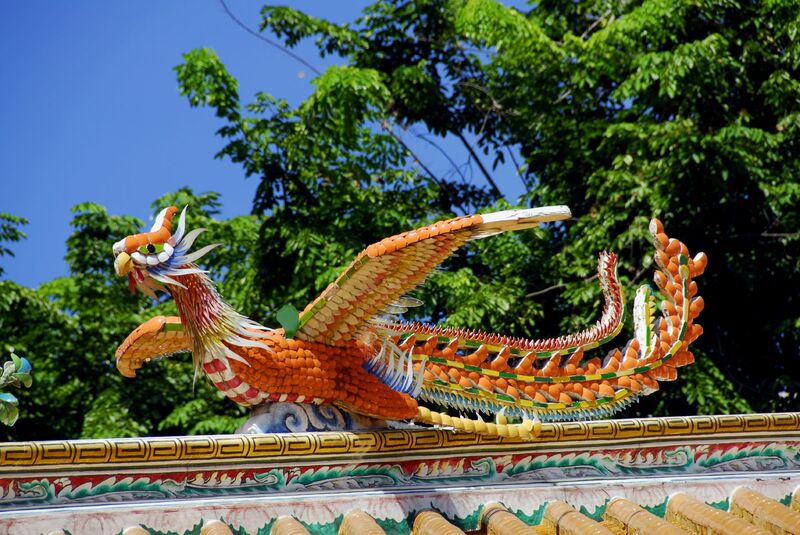 As part of our collective myth and legend in the Western world, the phoenix symbolizes renewal and resurrection. 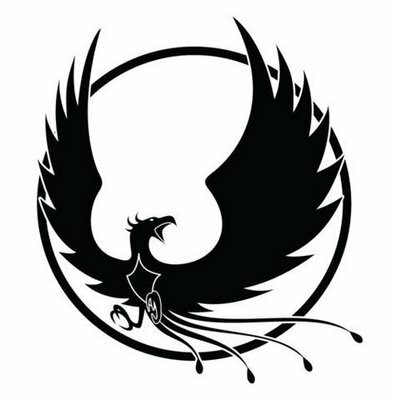 It’s interesting to note that many cultures have formed independent analogues of the Greek/Egyptian phoenix, including those of Persia, India (Hinduism), Russia, Turkey, Tibet, China and Japan. 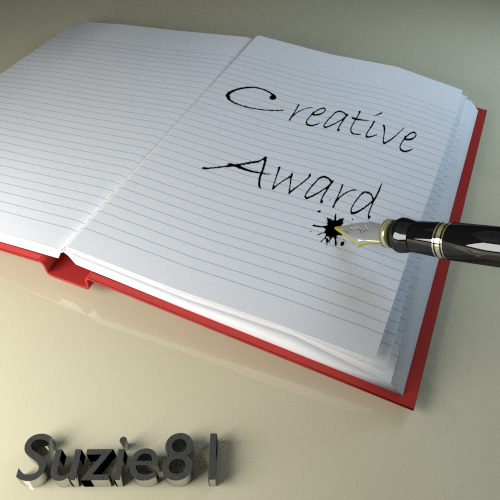 Rough Ideas: I am NOT a graphics artist…. After toying around with various designs and layouts for about a year, and researching the myth as well as how others had translated such ideas into art, I began my graphics design in earnest. I decided to avoid the more ornate and flowery, colorful phoenix portrays, and instead pursed a more minimalistic tribal style. 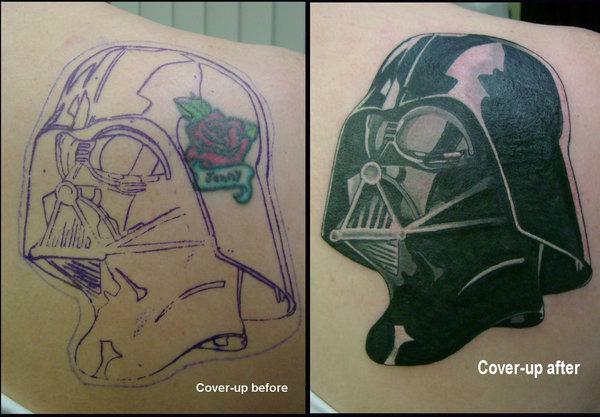 Finally, when I had narrowed my choices down, and after finding a tattoo artist (and service) I was confident and comfortable with, I was able to finalize the new blueprint. The tattoo artist here was indispensable; knowing both the medium and media, he was able to make some fine tweaks and additional recommendations on transforming my “permanent reminder” to match yet another temporary feeling…. 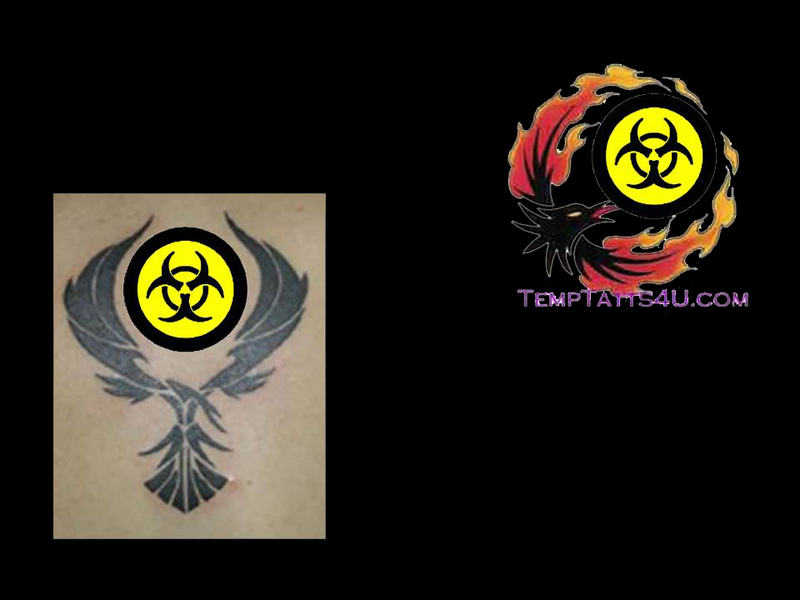 Thus, my artistic upgrade was completed in two phases: the bird itself fencing in the original biohazard tattoo, followed by the flames and biohazard re-treatment which together give rebirth to the creature (and my new lease on life), while subsuming the biohazard symbol itself…along with a tainted past. My new era ensues. We all need a harbingers to help announce and illuminate new eras throughout our lives, when the old have become stale and cumbersome. Change is the only constant in life, and if you let it, affirmative change can serve as the egg for your very own phoenix. Together, you both can rise from the ashes, no matter how bad you think the destruction may be. Thankfully for me, my harbinger resides with me, mostly out of sight, but always there in spirit (and the mirror if I really look). And while this permanent tattoo certainly serves my current temporal views and feelings more appropriately today, you may note that the tattoo is offset and asymmetrical, a reflection of the nature of life itself…. 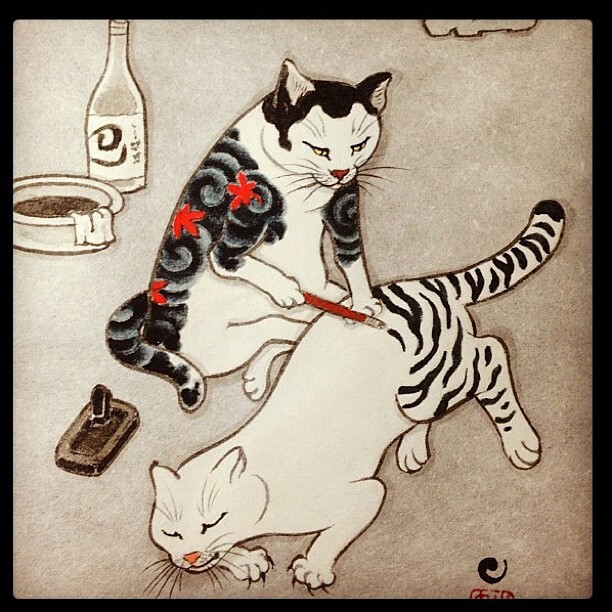 BUT, in a more pragmatic sense, because I’m leaving room for an old Far Eastern-influenced tattoo idea that continues to congeal the more time I spend in Asia…. Stay tuned for that development.